Keep up to date with the latest Richard and Richards news and any news from the industry that we think our customers might want to hear about. May I Integrate My Freestanding Washing Machine? This is a good question and I find myself getting asked this on a number of kitchen design visits. In short, yes there are a number of ways we can hide a freestanding washing machine, similar to the way the native built-in options do. Of course, there is a big but here! 1. A little bit of space is wasted, i.e hiding the washing machine behind two 350mm, or a 400/300mm combination takes up 700mm of space whereas the appliance would normally take 600mm. An Easyfit hinge may help here; this will allow the appliance to be hidden behind a 600mm door, although the appliance may be 595mm wide and the door on the hinge is 596mm wide; this will then leave a small line that the appliance may be seen through (albeit not much of an issue pending the lighting situation). 2. 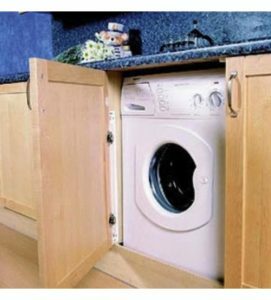 The entire run relating to the washing machine will need to be made deeper to accommodate the extra depth of the appliance to allow a door to fit over the front. For the more ‘space challenged’ kitchens, this could mean the lost opportunity for a good design. This also adds an increased cost for the deeper worktop. 3. The plinth will sit forward more than standard due to the depth of the appliances. This is a minor detail, but it will look different to the rest of the plinth runs. 4. A lot of washing machines have their filter accessible at the bottom and therefore the plinth will need to be less secured as standard to allow access to this. 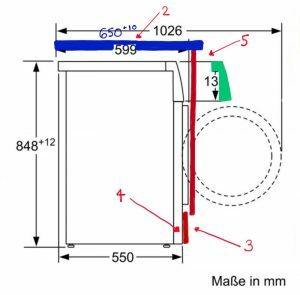 need to overhang the door, when the drawer is fully open you will only have a small window of access (approximately 25mm). This really does prevent the proper use of the drawer. My advice here would then be to use a small container that is put in with the washing, i.e a laundry ball. The iDos system would not work with this. Please see my image to fully understand this. I find this question is asked mainly on the grounds that freestanding washing machines are perceived as superior to integrated and also that freestanding is the cheaper option. With technology and innovations advancing, the gap is a lot less. For instance, the Siemens WI14W500GB boasts an 8kg load compared to older built-in only having 5-6kg loads. Not only that they have great features, such as time light to show you where it is up to with the furniture door closed and also the quiet iQdrive motor. Freestanding maybe the cheaper option, albeit it depends on which as some freestanding can be twice the cost of built-in. With the limitations for integrating a freestanding washing machine behind a door, I myself believe going for a native built-in is the best option, budget permitting. Regardless which our clients go for, we want it to be right for them. © 2019 Richard & Richard’s Design and Installation Specialists Limited. Registered in England and Wales – 07301123.